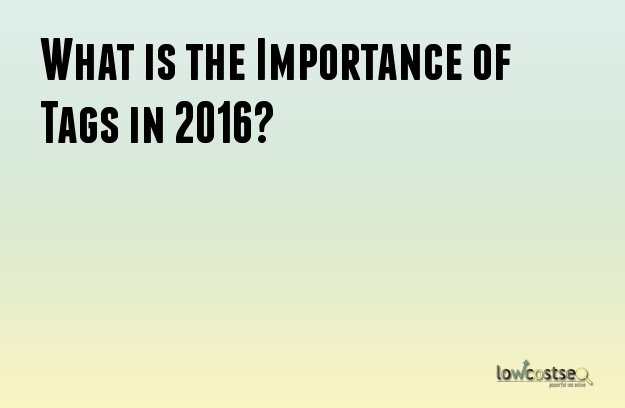 What is the Importance of Tags in 2016? Do you want to improve the visibility of your site? Do you want to augment your brand revenue? For this, you have to run a powerful SEO campaign. While developing social media presence, building backlinks, and other off-site factors are important for improving the ranking of the site, on-page optimization is also very important. One of the most important aspects of on-page SEO is the tags. Title tags, meta tags, header tags and the blog post tags, have been seen to increase traffic and also improve engagement. Given below are the role of tags and the impact that they have on SEO. Title Tags are used by Search Engines to determine the topic of a particular page. It is also displayed in the SERP’s. A good title tag displays what the user should expect from the page even before they click to view it. According to a research, in the year 2016, Google’s deviation to semantic search can affect the importance that title tags carry. It has been found out that title tags that are keyword optimized get a better ranking but the correlation has become smaller than before. At present, Google no longer needs title tags to have the exact keywords to interpret the subject matter of a page. However, the search engines will compare the contents of the page to the title tag, to ensure the consistency of the keywords while raking and indexing. These are HTML mark up that is used to differentiate sub-headings from the headings within the content from any other kinds of texts. Previously, only one header tag within the header was considered to be enough. Nonetheless, now you can use multiple header tags. The amount of pages using H1 tags have increased to a considerable extent in recent times in comparison to the year 2014. This would mean that designers take H1 tag to be an important part of SEO. Studies have also shown that header tags needs to be used effectively. Thus, it can be said that header tags plays an important role in SEO. Most of the blogging sites offer you the opportunity to add contextual tags to the posts and these are known as the blog post tags. This is a part of the taxonomy of the site. All the blogging platforms make use of these taxonomies to organize and classify the information in a better way. These tags can prove to be very valuable for the search engines as well as the visitor. For visitors, the blog posts tags improve the usability of the particular site as they are able to identify with the topic that the post covers. And for the search engines, it makes the interpretation of the contents of the page very convenient and thus, gives your site a better ranking. However, they are not directly responsible for the ranking of the website. Nonetheless, beginners need to keep in mind that the search engines do not rank categories and also tag pages very highly in the SERP’s of 2016. When you have high quality tagging it makes it easier for Google to see what the website is all about. They are a viable source of traffic and also provide you with the user experience.